Antique or classic furniture need not be very fancy, though some antique chairs can be really extravagant and and expensive too. 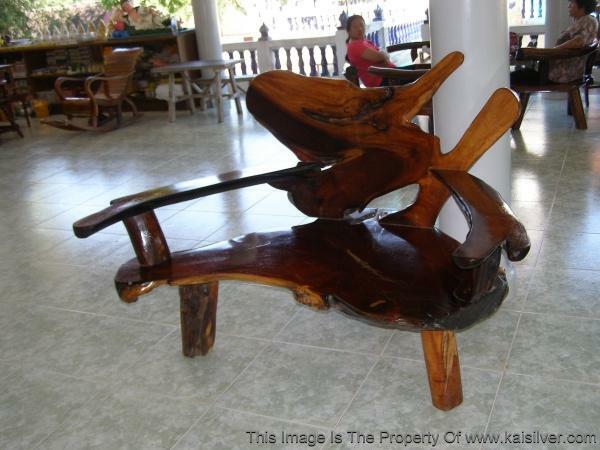 An old style chair could be more like a stool, made from wood and in some pieces could be made from a piece of bark. 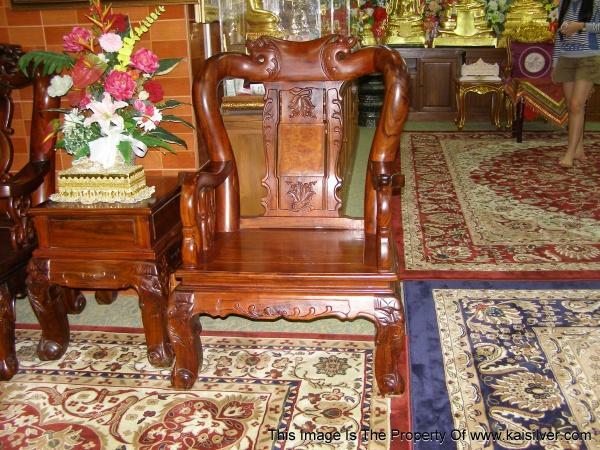 You would then have those amazing carved wooden chairs and surely some of these would be artistically inlaid. The Asians have mastered the art of giving a symbolic meaning to every thing that they make or do. Furniture was often elaborate and depicted, lions, elephants and other symbols. The Chinese royals had huge thrones with intricate carvings of animals and dragons. Somwhere in this magic world of unique and classic furniture there is room to showcase the skills and expertise of craftsmen and artisans. 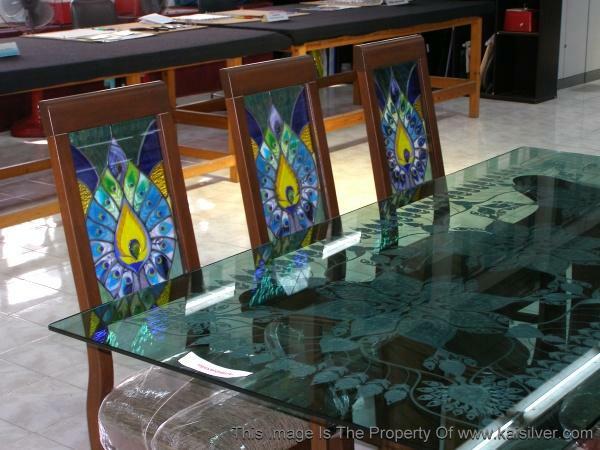 A province in Thailand which has a tremendous history for arts and crafts, is known for it's stained glass furniture. Pieces of colored parts are out to together to make everything from stained glass chairs to stained glass windows and room partitions. Here is a collection of widely different but equally interesting chairs, some are classic others are antique - all are bound to impress. What you see above is an old chair that is almost fully assembled from the bark of a tree. If you look at the portion that forms the back (back rest) of this wooden chair, it does appear quite like a fish. The seat of this old chair is made from a sliced tree bark as well. This is a very sturdy wooden chair and is often used in the place where it was photographed. Since most of the wood used to make this heavy chair has not been shaped, it does mean that this is a unique piece of furniture. Surely a one of a kind piece, never to be seen anywhere else in the world. A stupendous heavy wood chair, this old carved chair is shown in top condition. All the carvings on this antique style chair are done with the hand. It is this high level of skill and craftsmanship required to make such antique furniture that, puts a very high price tag on them. This in turn results in a limited client base, something that does not work in favor of the craftsmen. This explains why the number of skilled wood craftsmen and artisans is dwindling even, in Asian countries. Another fact is that environment groups, might not favor such lavish wood furniture today - each of these heavy carved chairs does consume a lot of wood. We were quite amazed to see that the place where this carved wood chair was placed was fully accessible to the public and that, visitors were actually allowed to sit on these antique furniture pieces too. 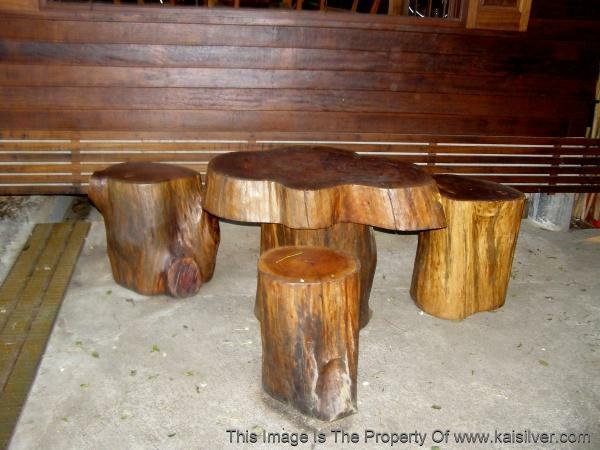 An extremely simple set of sitting stools and table, notice the natural and rustic feel of these unique furniture pieces. The location of these heavy wood stools is as expected, near to a forest area. Tree barks have been cut into pieces, smoothened and made into stools. A similar stub is used to make the base of the table too. A large tree bark, has been sliced to form the top of the table. These unique furniture styles can actually be made all over the world, though they are quite common near forest areas in Asia. Exporting such furniture out of the country could involve a few legal formalities. Shipping costs for exporting such heavy pieces of furniture, could also be very expensive. What cannot be forgotten is that, these wooden stools and table, are very durable and can last for generations. It might be possible to provide a fine silica based coating, on the furniture to make them water proof. A tremendous show of craftsmanship, these stained glass chairs are part of a more elaborate set of antique style furniture. The table top that can be partially seen in the image is a large piece of thick glass that has been etched with some amazing Asian designs. Back to the stained glass chairs, the back of each chair is made by putting together small pieces of colored glass. We were fortunate to see the artisans working on such stained glass furniture, the work tables in the background is where these classic ideas take root and get executed. We can therefore say with confidence that these colored glass chair backs are NOT made by, simply painting a large piece of glass. The craftsmen use sharp tools to cut out those fancy shapes from glass panes of various colors. These pieces are then intricately placed and fixed into position. The furniture shown on this page consists mainly of antique style chairs, classic and unique pieces of furniture that are not easy to find today. We would like to clearly state that we are NOT involved in buying or selling any of the merchandise shown in this report. Our team put together the images and content, as they were eager to share this information with you. We do hope that you have enjoyed the content and found it to be as interesting as we did. You can view more of these classic furniture pieces at http://www.leisure.food-recipe-cooking.com/unique-antique-chairs-furniture-fcr-01.htm It is hoped that our report will get more people interested in the art of designing and crafting unique types of furniture. 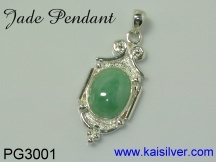 A gorgeous antique style jade pendant. Custom made in gold or 925 sterling silver, this antique pendant can be crafted with the gem stone of your choice ... more. History's most meaningful jewels, the claddagh ring dates back to more than 4 centuries. 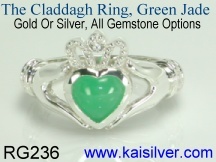 Kaisilver claddagh rings are considered to be the best rendition of the jewel ... more. 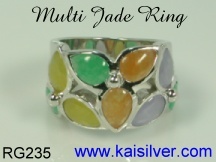 A rare multi jade ring that combines jade in three colors. A fine jade ring available in gold or 925 sterling silver. You have all gem options to choose from when ordering ... more.